I thought that a few pictures from our usual morning walk on Sunday would be appropriate for this week’s photo theme. We walk along the trails in our local parks, more often than not landing up on the C&O Canal towpath by the Potomac River. We started this weekend’s walk at White’s Ferry. The mist was still rising from the river when we got there even though it was somewhat late in the morning. The ferry was operating with a light load. We saw some giant puffball mushrooms during our walk. I do not recall having seen these before. They are apparently edible if consumed before the spores have begun to form. We walked up to Lock 26 on the towpath to see the historic silver maple tree near the Dickerson Conservation Center. It is huge! This tree is on the current list of Montgomery County Champion trees. Here are a couple of shots of the woods and the trail. We got back to Whites Ferry in time to get some sandwiches for lunch at the store by the ferry. These kinds of places are far away from regular commercial locations and depend on a different kind of clientele to stay in business. They are usually operated by some locals just trying to get a little bit of money. 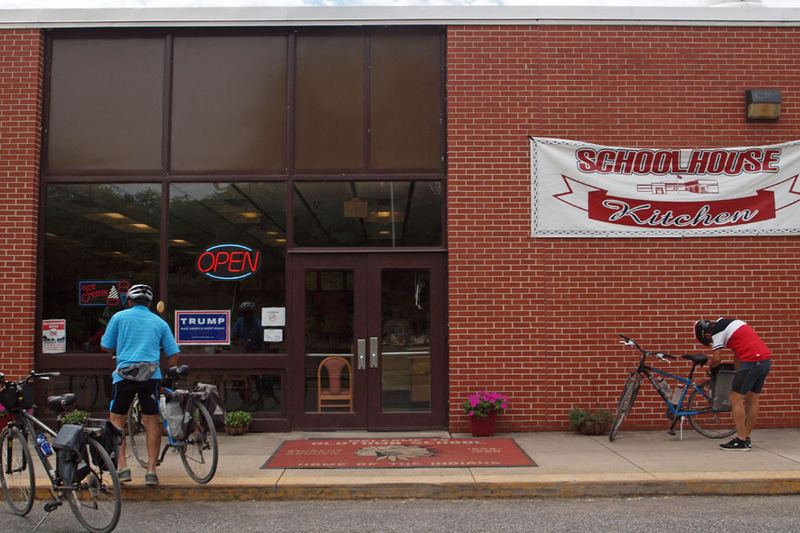 (I still remember the Schoolhouse Kitchen in Oldtown, MD, operated out of a closed school building, that we ended up at during the KVIITM75 bike ride.) You can see the bare-bones nature of the operation and get a sense that they are just getting by. We sat at a picnic bench and watched the Jubal A. Early in operation. The sky had cleared up during our walk. Our Sunday walks are something that I look forward to. Pingback: Local: Shop | What's (in) the picture? What a beautiful local place for a walk!